The Foreign Exchange and Foreign Trade Act was established based on international agreements controlling exports of goods and transfer of technology with the aim of maintaining international peace and security. In order to comply with this law in overseas projects, Chiyoda established the compliance program (CP) regarding export-related laws and regulations and registered it with the Ministry of Economy, Trade and Industry. The CP defines the export control policy of Chiyoda, and detailed procedures, rules and manuals. Based on the CP, Chiyoda organize the Export Control Committee where Legal & Compliance Department serves as a Committee Secretariat to enforce export control management such as inspection, education and internal auditing. Chiyoda also has an operational manual to inform and educate its employees on the Company’s response to the Export Administration Regulations of the United States. 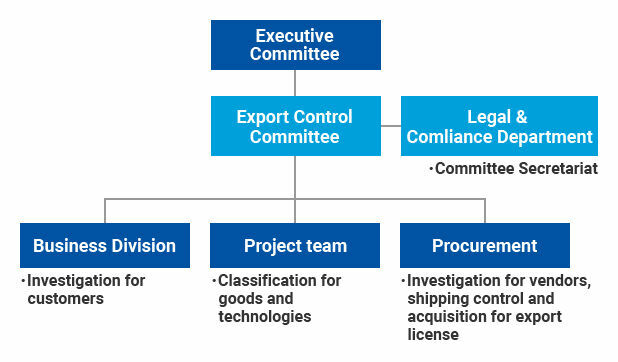 As mentioned above, the export controls are administered with the organizational structure constituted by the Export Control Committee, where the Legal & Compliance Department serves as the Committee’s Secretariat, under the immediate direction of the Executive Committee. The routine export control activities are carried out by export control coordinators assigned in each organizational department, and are followed up on as a double-check by the Legal & Compliance Department for reconfirmation. The training on export controls is provided to new employees training and mid-career recruits training in terms of their careers or positions. Also, a class room-type lecture is provided as the basic training course to all of the employees entering into a two-year career in the company so that they can grasp the basic knowledge of export controls. Furthermore, all the engineers who have finished the above basic course are required to take the special training course in order to have knowledge necessary for the determination of the classification for goods and technologies as to whether they shall be subject to export licenses. Project teams and supporting departments perform the classification in accordance with the export control manuals which are corresponding to the Japanese and U.S.requirements respectively. No items should be shipped out unless the required screening has been completed. Based on the CP, the Legal & Compliance Department is to annually audit the relevant documentations and the implementation situations on the export controls for all of the on-going projects. Also, as the preliminary audit, the Department is to select major projects from among such on-going projects and conduct hearings from those concerned on a semi-annual basis.